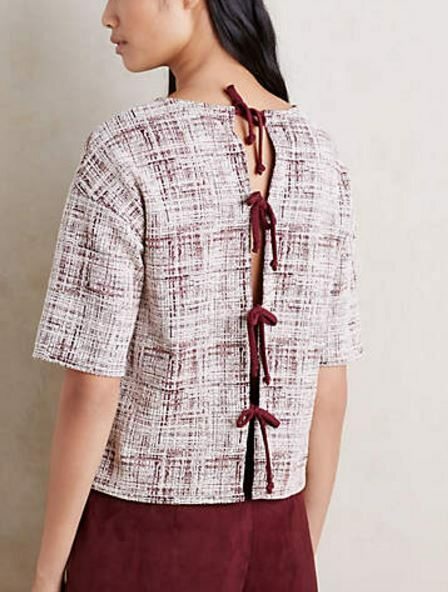 I just bought this top from Anthropologie. 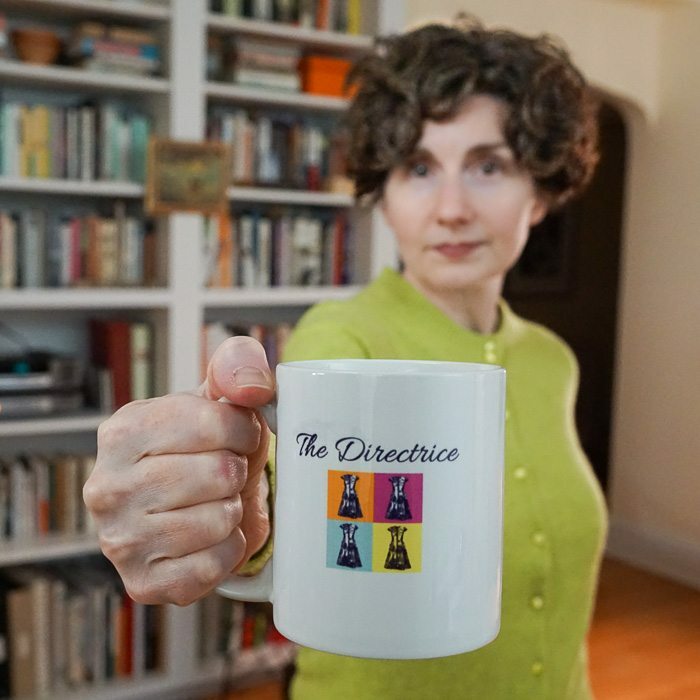 Perhaps you’re thinking, Why, Directrice? That sad, drab, shapeless rag . . .
What could be more charming than this back? Also, I like the severe lines of the front and think the top has a vaguely 60s (early 60s) vibe with some Japanese kimono undertones. Laura Petrie and The Mikado are top-notch design influences. Unfortunately, however, the top has precipitated a rare crisis of imagination. I had thought I would wear it over a crisp white blouse with cropped grey trousers, but when I tried it — non, non. It looked very awful. I tried five different white blouses under it and they all looked varying degrees of awful. So I turn to you, my brilliant readers! How would you wear this? How do you think I should wear it? Submissions for office-wear and casual dress are equally welcome. Wishing you a cozy Thanksgiving — I hope it’s reflective or raucous to your taste — and taking the opportunity to thank you for visiting this blog, reading my posts, and sharing your comments. The back is darling (and very you, IMO), but…hmmm. The front looks crisp to me, so a crisp white blouse probably leads to too much ‘crisp’ and looks too structured. Have you tried a silk blouse? Something with flowing fabric? 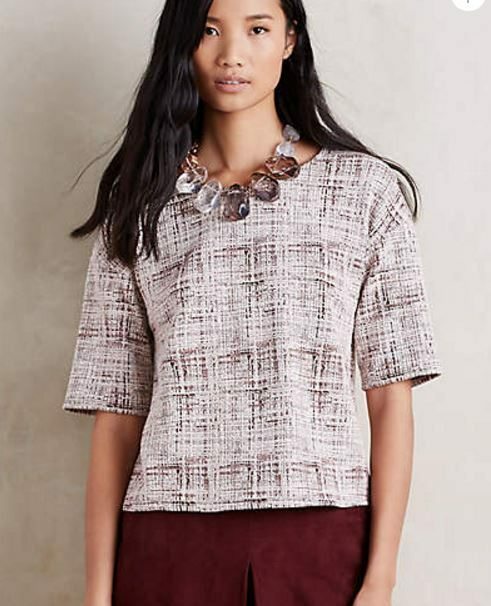 Or an arm-hugging long-sleeved silk knit top underneath? I bought a collection (every color!) of supple silk knit tops from Marshall Field’s years ago and to this day when I don’t know what will work as an under layer, these tops always seem to come through for me. Wish I had better ideas. :-/ Your style is way more fun than mine! I’m with Linda: fitted knit top underneath. I like the neckline of the top as is–adding something with a collar would detract from the clean lines. I’d go with the same burgundy color as the ties in the back, with a different-colored bottom, or a knit top in the same color as the bottoms, so that this piece stands out. Along the same lines as the latter idea, a long-sleeved fitted knit dress underneath might also look interesting. I know it’s not the usual, but have you tried it on backwards…without doing up the top tie? Wear it as a little cardigan/topper. Roll the sleeves a couple of times – maybe the fabric “wrong side” is interesting to look at as well? I agree – the dropped shoulders have an Asian flare so for maximum impact, I say wear it with a simple shell underneath for modesty, feature the top as the model wears it with an amazing necklace, and go for really really wide legged light linen cropped trousers (like culottes). But I’m visualizing this in spring/summer… not now. Some things just need to be returned to the store, Directrice. But maybe that’s just me. Happy Thanksgiving kitten! How about a soft body hugging turtleneck underneath. Then a long slim necklace might look nice. Are the ties in back the only way to close it? How in the world could one wear it if single?? I’d wear it without anything underneath (although not to work), with something in burgundy on the bottom. And I love the necklace the model is wearing, and would try to buy it. I can picture you wearing it with navy, perhaps navy hugging turtleneck and wide legged navy trousers? Or navy pencil skirt with tall brown boots? It is a great top. I would hate to return it too. I like many of the ideas here. What about a silky or knit tank from the opposite side of the color wheel? Some sort of bright green. I wouldn’t. Sorry but this one is a miss. So very boxy & an unattractive color. I agree the back IS interesting. IMO if you have to force a garment this much perhaps it was not meant to be. I really like this top and agree with Lynne above that the necklace is very nice with the top. Directrice how about one of your necklaces. You have the crazy Marni one with some massive clear glass like structure don’t you? I like the idea of this top tried with a narrow belt around the waist, to make it a bit peplum in effect. You could do a black (I think those are flashes of black on the weave of the top) or burgundy to match the top and ribbons on the back, or … Yellow might be nice for a spark, or navy. As for what to wear on the bottom …just try on all sorts of things. I like the idea of the inverted pleat glimpsed on the model, and an a-line skirt. Should be fun. Have a glass of champagne first! Or what about wearing it backwards as a little jacket? Maybe with something dark (burgundy, charcoal, navy) and sheer, perhaps with belled sleeves? Or as suggested above, with a burgundy cami or shell beneath. I joined pinterest so I could have a better look at some of your previous outfits more easily (other than through gauzy black – damn them). It’s hard to judge on-screen how well the colour plays with white – is that what made the shirts sulky? If not the colour, I wonder how it would look with white trousers, or the simple white dress? If it is the colour, you have some off-white, and fawn/pale khaki pairs that might work. I’m not sure why, but I can’t help but wondering how it would work with your silver skirt, but it would probably need something else up top to work in, and I’m not sure what would work. I do like the idea of fitted knit tops underneath, though think a turtleneck might be too heavy for the neckline. I know you have some loafers (and perhaps some ballets) that might work in with such a look. I look forward to seeing how you make it work. Ha! The mug is a prototype made for me by my husband. I’ve been thinking about making more to send as rewards to the most prolific comment writers — but need to run a feasibility study first. I think postage and packaging might cost as much as the mug! Isn’t it cute, though? I’m with the tank top vote. If you’re cold then wear a wool t-shirt with short sleeves you can’t see under it. You might try a scarf wrapped at the neck with the ends trailing down the back to accentuate the ties.